After a couple of hours admiring the artful motorcars in the warm, reverance of the East Exhibition hall and after devouring a slightly pricey, but definitely delectable lunch at the Iris Restaurant in the West Building (regrettably not named after us) we are lured by the low lighting and whisper quiet aura of the European Section to curl up under a nearby “objet d’art” for some serious shut-eye. Not wanting to wind up forcefully but with a librarian like quietness evicted from the museum, we opt for outside exercise instead. The fitful drizzle has abated somewhat and it appears safe to Munzee hunt in the target rich parking lot and to critically eye some exterior artwork. 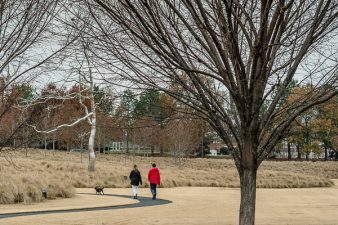 The trail outside the museum meanders through a lovely selection of artwork including a metal tree (shown above) much like the ones we saw in DC and Kansas City. Although we have never witnessed one of these trees in bloom, they are apparently able to propagate and to survive in a number of climates. Not too far down the path, we encounter a lovingly restored whirly-gig from the Vollis Simpson collection. These clankey assemblies of vibrantly painted leftover mechanical parts and imagination are the kind of folk art that Storm and I can appreciate. We learned about Mr. Simpson years ago when we stumbled across both his personal collection (see photo above) and Mr. Simpson in person at his workshop across the road from the whirly-gigs. We were treated to his stories about the enormous contraptions he had tethered there as well as updates on his ongoing battle with beavers determined to flood the whirly-gig field. Although his work received wide acclaim, Mr. Simpson was always kind and welcoming when we were lucky enough to catch him for a visit. 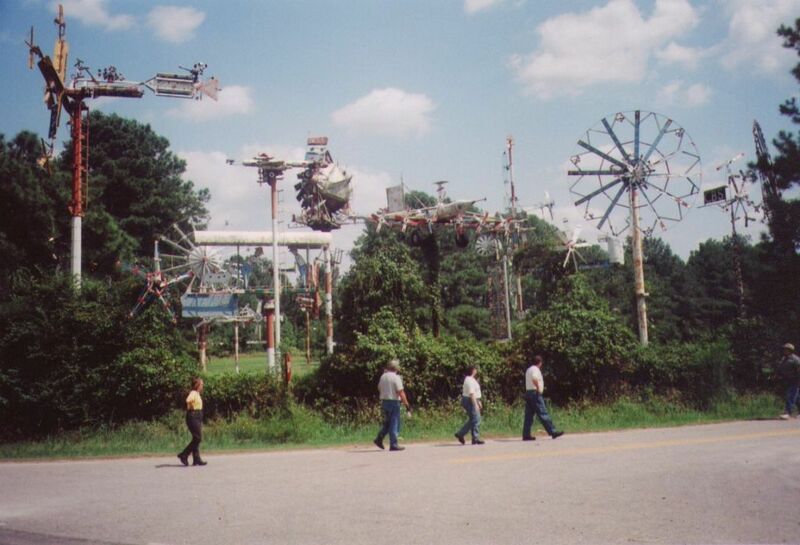 If you travel much in NC, you can also see his whirly-gigs at rest areas on I-95 and at the Wilson Whirligig Park & Museum. Let me know what you think if you get a chance to visit.